Not only is good posture important for back pain; it can make people look younger and slimmer. Good posture also increases productivity and improves mood. Thus, any device we can use to improve posture also improves our quality of life. Many of us work 7 to 8-hour sit down jobs, and sitting down for that amount of time is unhealthy. No matter how much I try to sit with good posture, things slip, and I forget. Luckily, there is a solution – the BetterBack. While wearing the BetterBack my spinal alignment is automatically better, removing the effort needed to continuously self-correct. 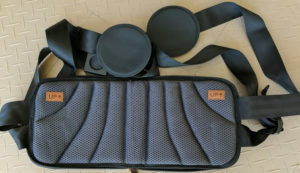 In this review, I’ll explain more about the company and how the brace works. The Better Back is SharkTank product, and people who sit for hours each day have a great opportunity in using this product. 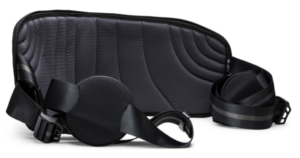 The company claims that you can use this device for just 15 minutes per day to improve your posture, ease back pain, and improve your overall health. However, you can wear it longer if you wish. Good posture tends to affect your health, mood, and motivation, which is the exact reason the founder created the device. If you want to produce a better quality of work or get into a better ‘state’ while meditating, then this device could be the answer. The device raised over $1,650,000 on Kickstarter and Indiegogo and achieved over 20,000 backers, which shows there’s a great market for this kind of device. The brace instructions are straightforward. Simply start by placing your feet flat on the floor, wrap the back pad around your body, and hook the knee pads over your knees. You then lean forward and grab the adjustable leg straps, before sitting up straight while you pull on the straps to make sure the device is as tight as it needs to be. There’s also the option to use a center clip to keep your legs together for the ultimate posture results. There is no right or wrong way to wear the posture trainer. You must find the perfect fit for you, so make sure you play around with it at first depending on what feels best. Better Back is not safe to wear while driving. My first thoughts were that it’s a great concept since there are so many people working at a desk for hours a day. Back problems and feeling fatigued are common issues affecting today’s workforce. I liked this device immediately because it doesn’t focus on pulling the shoulders back. Pulling shoulders back alone is not a recommended way to improve posture, although many posture correctors focus on this. This device comes in a high-quality package. I didn’t realize that it was a Kickstarter project until the package arrived. You can usually get a discount of around 15% – 30% off the device if you check back on their website regularly enough. I had a little trouble putting it on at first because my legs are so long that trying to tighten the straps was a challenge, especially with such short straps. However, it comes with a clear and easy instruction guide. I wore this for about 2 hours the first time I used it. I had 100% rigid posture the whole time, and my feet were placed flat on the floor. Although my feet were flat, the company states that you can cross your legs too if you wish. After 45 mins, my face was a bit flushed because there are some muscular differences to get used to while wearing this, so bear this in mind if you think it’s going to be an easy ride. I was using muscles I was not used to, and you likely will too. 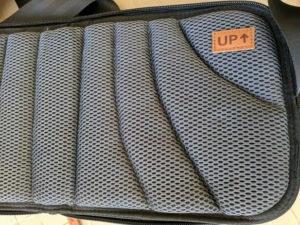 This device helped not only with my posture but with my work results. I didn’t get up from my desk because there is a process to remove and then put on the brace again – so tended to get things done. Having my feet flat on the floor helped to keep focus. This brace made me sit still in one position and do nothing but work. People that walked by noticed my good posture while wearing this. I was always in one fixed position. Part of the effort to wearing this is that I do not lean back in your chair and relax. I lean against the brace for support, which means I am supporting myself instead of relaxing in a chair. It’s a similar feeling to having a stand-up desk where you stand up and work. Not very relaxing (not that work should be), but it is healthy. Since the Better Back is focused on stabilizing the pelvis, it is a non-traditional way to improve posture. It doesn’t affect the shoulder area at all. On the second day, I spent more time getting the straps adjustments correct when putting on the brace. I realized then that I could move the clip between your legs forward or back depending on if you want your legs closer or further apart, which helped with the comfort factor. When putting the device on, I noticed some muscle stiffness still in effect from using it the first day. In hindsight, I may have started off wearing the device for too long and perhaps should have built myself up a little slower. I decided to push through it on the day and see if my muscles could get used to sitting with perfectly straight posture over several days and weeks. I did have to skip a day in the end because my muscles were tired. It’s very easy to put on once you get used to it, and again, I look forward to wearing this device. I have experienced good things in term of my mood and work productivity with the BetterBack. I haven’t noticed any permanent effects on posture yet but will be watching that carefully over the next several months to see how the posture training works. 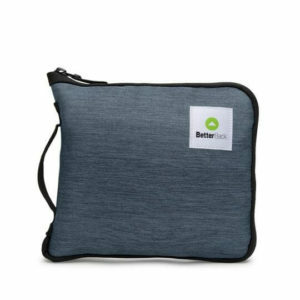 The Better Back is a very good posture training product. It bests many other posture trainers on the market. Easy to wear device that you will get used to putting on quickly. 100% posture correction and not a temporary fix. Great price and discounts are available. Good concept for providing lower support for posture, instead of pulling shoulders back. Can only be used while sitting down. May not be so suitable for those who want better posture but only sit down for a short amount of time each day. Will cause muscle soreness if used for too long in the beginning. It’s better to build yourself up slowly. This posture trainers concept is innovative. It’s perfect for those who work sitting down. It’s not only for better posture but for better mood and productivity too. It’s worth the investment if this sounds like something you could use, especially with the regular discounts. There are plenty of good reviews that you can for the Better Back, that give you a better overall picture of how this device works. Thanks for reading and we hope this review was helpful!